Booking It With Hayley G: My Secret To Tell Blog Tour: Spotlight, Q&A, Excerpt and Giveaway! My Secret To Tell Blog Tour: Spotlight, Q&A, Excerpt and Giveaway! His smile is a crime. You can’t always trust the boy next door. After years as a professional paper-pusher, NATALIE D. RICHARDS decided to trade in reality for a life writing YA fiction. She lives in Ohio (Go Bucks!) with her husband, three children, and a ridiculously furry dog named Yeti. This is her second novel. Visit her on Twitter @natdrichards or at nataliedrichards.com. 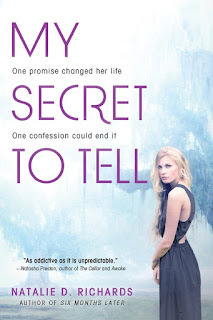 This October Natalie D. Richards releases her latest YA thriller, MY SECRET TO TELL. To celebrate, Natalie is here for a quick Q&A and has brought an excerpt to share! What character do you relate to the most in MY SECRET TO TELL? But if we look at situations more than strict personalities, I think I’d have to admit I related to Chelsea. Before I lost my father, I had more than a few Very Scary Trips to various ICU wards in various hospitals. My father had lots of health troubles, so the reasons were different, but I understand very well how terrifying it is to sit at a hospital bedside with your parent—both familiar and heart-breaking. My name lands somewhere between a hiccup and a sob, and my feet stall out on the sidewalk in front of my house. I adjust my grip on the phone, hoping I misheard her tone. This doesn’t sound like Chelsea. This voice is breathless. “I’m not.” She takes a shuddery breath. My shirt’s sticking to my back and cicadas are click-buzzing the end of another blistering day, but I go cold. Something’s wrong. “It’s my dad, Emmie,” she says. I can tell she’s crying. Chelsea’s still crying when I storm down the hallway toward my bedroom. Chelsea makes a strangled sound, and I notice the liquid-thick heat in my bedroom. The kind of heat that tells me the air conditioner is broken. Or my window is open. My gaze drags to my fluttering white curtains, to the dark smudge on the windowsill. I swivel with an invisible fist lodged in my throat. My bathroom door is open, a red-black smudge beneath the knob. My mouth goes dry, my pulse thumping slower than it should. Then I see the blood on the floor by my sink, and my heart tumbles end over end. “We’re here. I’ll call soon,” Chelsea says and hangs up. I see him, his back to my tub and his dark head bowed on one bent knee. Oh God. He’s covered in blood. It’s on his legs, his hands. Dripping onto my white tile floor. He looks up, and my heart goes strangely steady. Don't forget to enter the giveaway hosted by the Awesome Sourcebooks! Special thanks to Sourcebooks Fire for allowing me to participate in this tour! So happy to be featured on your blog for My Secret to Tell! Thank you so much for having me!